On Sunday, The Stanford Review proposed and emailed a petition and manifesto for a new “Western Civilization” humanities requirement to the student body. Intended to be placed on the undergraduate Spring Ballot, the petition has sparked a flurry of reactions ranging from reflection on the state of the humanities at Stanford to outrage at the Review’s perceived exclusivity. The proposed requirement intends to introduce freshmen to the humanities through “the politics, history, philosophy and culture of the Western world.” It positions itself as a more focused alternative to the Thinking Matters (THINK) and former Introducing the Humanities (IHUM) programs while still exposing students to a variety of works that shaped Western culture. Within 48 hours of the Review’s email, their petition had been signed by nearly 200 students, who offered a number of reasons for their support. “It is precisely to bring light to the limitations and mistakes of Western thought that we should study it, because—like it or not—we are a product of it,” said Roberts Mencis ’18. “I think a specifically Western Civilization core is a good idea because understanding the West informs our understanding of the context of Stanford, as well as how much of the world has developed,” said Andrew Granato ’17. A common opinion expressed by signees is that Western Civilization would be an improvement on the current THINK curriculum by providing a stronger introduction to the humanities. Similarly, a number of students felt conflicted about their signature, or only signed the Review’s petition in order to promote discussion around the study of the humanities. However, many students viewed the Review’s proposal negatively, with criticism directed at the proposal’s singular focus on Western culture. Some students thought the Review’s proposal was misguided, or designed to provoke students. “I believe the Review’s specific proposal was written with incendiary ambitions and reflects a purposeful attempt to agitate certain communities on campus,” said Justin Hsuan ’18. Other students went so far as to accuse the Review of colonial attitudes. “In [the Review’s] assertion that Western cultures have contributed more to American society than any other, they forget the tendency of Western cultures…to pull values, norms and institutions from the societies with which they came into contact without giving proper credit to the originators,” said Biola Macaulay ’16. Stanford’s humanities core” by “center[ing] on crucial thought and ideas, irrespective of geographic origin.” The counter-petition had 128 signatures as of Thursday night. “It’s not enough to bring in a couple of texts from authors of color and call that a well-rounded and thorough examination, nor is it enough to say that Western civilization is the ‘dominant’ civilization in history,” Rodriguez said. “Proposing that all students focus only on the West is not only regressive, it is harmful to our campus well-being,” Finley said. “That article received a lot of attention, and that started a lot of discussions throughout the year about what an ideal humanities core would look like,” said Camhi. Over the course of 2015, the Review worked out their ideal humanities core, culminating in the Western Civilization program. If passed, Western Civilization would have one curriculum, in which freshmen would read the same texts and take the same two-quarter class—possibly all at the same time. The Review justified their decision to not include non-Western civilizations such as East Asia and the Islamic world, citing global importance and depth. “The reason why one civilization is so important is because it allows you to get a degree of depth and interdisciplinary understanding that we felt you cannot get even by focusing on two civilizations,” said Camhi. Western Civilization’s largest effect would be to replace the THINK program as a graduation requirement. According to Elliott, the elimination of the former Western Culture program in the 1980s marked the beginning of a “race to the bottom” in terms of rigor required by humanities classes. Alternative programs for freshmen, such as Immersion in the Arts (ITALIC) and Structured Liberal Education (SLE), will continue to exist alongside Western Civilization. Elliott highlighted his experience in SLE as “the single strongest factor” that played into his push for Western Civilization. 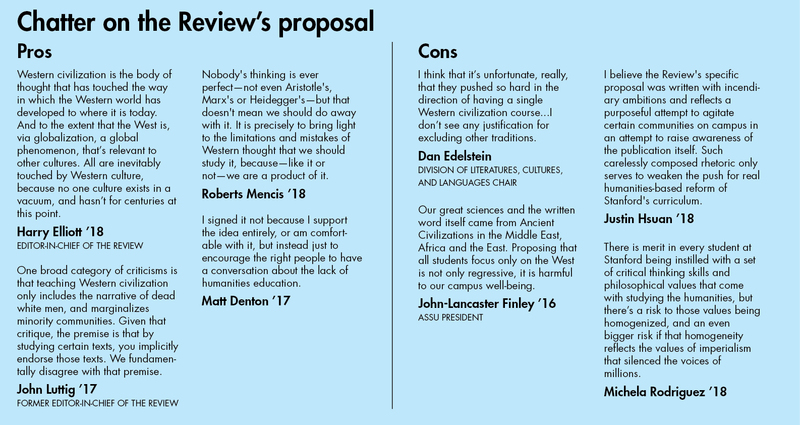 Well aware of the backlash to their proposal, the Review published a flyer to respond to the issues raised. “One broad category of criticisms is that teaching Western civilization only includes the narrative of dead white men, and marginalizes minority communities,” Luttig said. To that end, the Review aims to incorporate works from minority writers and feminists, such as Frederick Douglass and Simone de Beauvoir. They also rebutted notions that the proposed curriculum would praise the West while overlooking atrocities such as slavery. Even if it ultimately fails to pass, Elliott acknowledged that the Review’s proposal has done what it was intended to do. “I think we’ve already accomplished the most important issue…which is to have a discussion on the decline of Stanford’s humanities core,” Elliott said. Communities across campus have targeted the proposal’s Western focus. Colin Kimzey ’17 spoke to The Daily on behalf of “Who’s Teaching Us?,” a student group that stands for faculty diversity and marginalized studies at Stanford. The First-Generation Low Income Partnership (FLIP) group also took issue with a claim made on the Review’s “Concerns & Replies” flyer that argued that students from lower-income schools might benefit from the proposal. “FLIP does not support The Stanford Review’s exploitation of our community for its own political agenda,” the group wrote on Facebook. Tensions also flared over a Review allegation that FLIP had suspended a member for publishing an anonymous article in favor of the Western canon. FLIP issued two clarification statements denying the claims, but did not respond to the Daily’s request for comment at the time of publication. Meanwhile, distrust between different student groups has fueled the controversy. 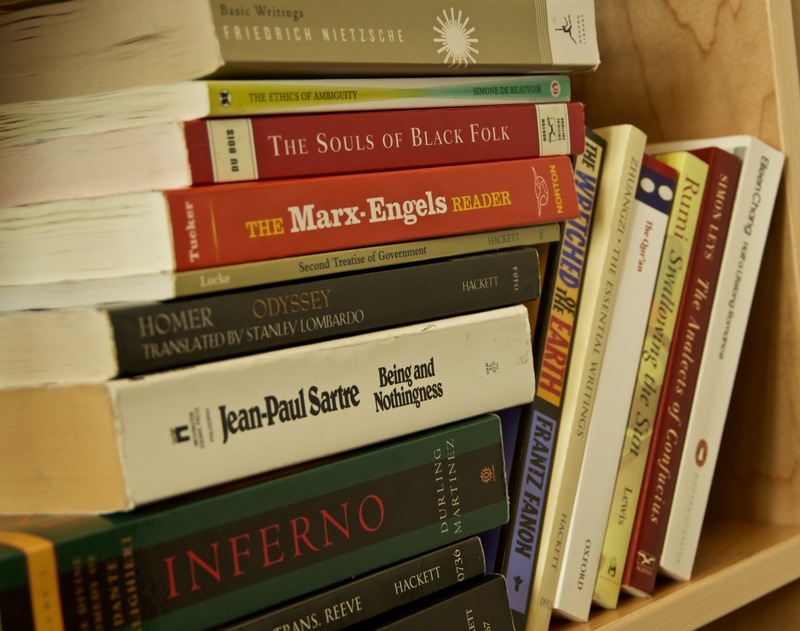 On the debate over the Western canon, history professor emeritus Mark Mancall believes that the student conversation was “missing the point.” Mancall co-founded SLE in 1974 with political theorist Hannah Arendt. The broader issue of reinstating a humanities core is something that Dan Edelstein, Chair of the Division of Literatures, Cultures and Languages and professor of French, said he was “very much in favor” of. “I think that it’s unfortunate, really, that they pushed so hard in the direction of having a single Western civilization course…. I don’t see any justification for excluding other traditions,” Edelstein said. But like Elliott, Edelstein is glad to see that students have been talking about the humanities and their place at Stanford. Contact Fangzhou Liu at fzliu96 ‘at’ stanford.edu and Jacob Nierenberg at jhn2017 ‘at’ stanford.edu.